Connecting community tornado safe rooms provide protection for employees and customers of manufacturing and packaging buildings as well as other businesses having space adjacent to their buildings. This type of safe room has several advantages including cost of construction. Connecting safe rooms are available in varying sizes and configurations. The connecting community tornado safe room has the advantage of providing direct access to safe room for employees and customers seeking protection during severe weather events. The safe room is accessed directly from the plant or business through a FEMA-compliant tornado door in the main building exterior wall. Persons seeking shelter do not have to go outside through lightning, hail, and wind-driven storm debris to access the safe room. A second FEMA-compliant tornado door on the exterior of the safe room provides egress from the safe room directly to the exterior. This provides an additional emergency egress door from the main facility. A connecting tornado safe room for protection of plant personnel. Access to the safe room is through an interior FEMA-compliant tornado door; occupants may exit through an exterior tornado door. 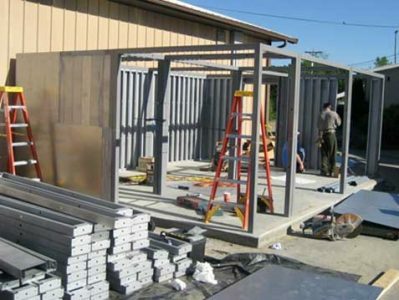 The safe room components are assembled on a concrete foundation. High velocity impact shields are bonded to the frame and wall panels on all sides of the safe room. The assembled safe room is anchored to the foundation slab. Debris impact shield is bonded to the exterior and vent cowlings are installed. 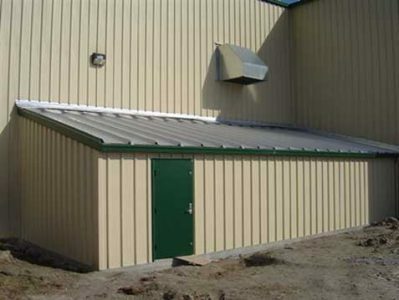 The exterior of a connected tornado safe room is finished to match the décor of the existing building exterior. We are in our shelters now as we are under a tornado warning. Our most important asset is our team members, the addition of 2 of Remagen’s 100 person storm shelters to our data center ensures the safety and well being of those team members in times of severe weather. Remagen was able to custom design a solution that best fit our existing facility layout and meet our needs for a quick and easy shelter occupation plan. 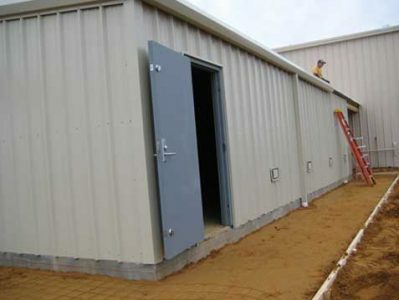 The connecting tornado safe room can be constructed without interference to the on-going activities within the facility. This type of safe room does not reduce the operational space of the main facility. 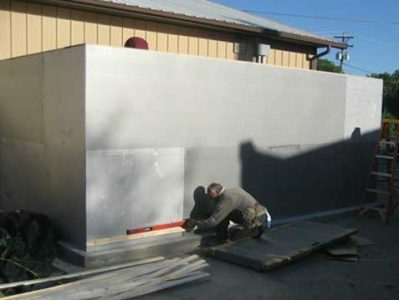 A connecting safe room is easily finished with weather-proofing material to match the décor of the existing building. A high quality connecting tornado safe room provides safety and peace of mind to employees as well as the company’s visitors and customers when the area is threatened by severe weather.